Remember that classic movie "Mr. Smith Goes To Washington?" It was about a naive political outsider who got appointed to the United States Senate. 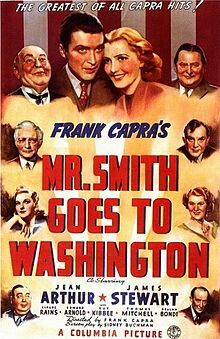 The difference between Mr. Smith's trip to Washington and Donald Trump's arrival there is that the two men are complete opposites. While Mr. Smith fought corruption, Trump brings it with him like a dark cloud. Mr. Smith was a real patriot. He knew the Russians weren't our friends. 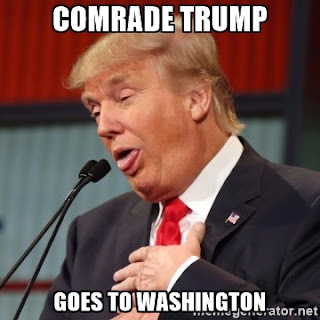 "Comrade" Trump can't wait to get sworn in so he can have a slumber party with Russian dictator Putin. Mr. Smith was well-spoken and sincere.Trump talks in jingoistic monosyllables and 140 word tweets (usually with misspellings). Mr. Smith was out to stop greedy Congressmen who cozied up to corporations. Trump has formed a Billionaire Boys Club for a Cabinet, stocked with the greediest men on the planet. There were no scandals (despite his enemies attempts to create one) about Mr. Smith's life. Trump's scandals are so numerous that you need to categorize them alphabetically. Mr. Smith was all about honesty. He refused to tell lies to further his career. Trump has never done anything honestly in his life. Try reading his book "The Art of the Deal." He praises any means it takes to get one's way. Lying is second nature to Trump. As the Leader of The Boy Rangers (same as the Boy Scouts) Mr. Smith stressed that the truth must be told at all times. Mr. Smith eventually helps "Drain the Swamp" in Washington and there's a happy ending. Democracy won again. Trump drained the swamp of alligators and replaced them with crocodiles (who are significantly bigger than the the alligators). Mr. Smith's story had a happy ending.